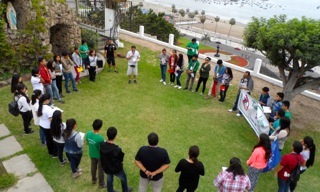 As part of the Youth Ministry Plan of the province of Perú, a workshop for leaders (JOSAC – PE) was held from Saturday 12th till Monday 14th December 2015. 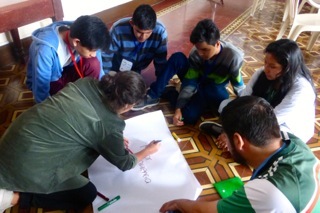 Those who took part were the young people from our schools who had attended the first workshop: Sacred Heart IPNM Annex, Sacred Heart Chalet, Mater Admirabilis - El Agustino, Sacred Heart Sophianum, Sacred Heart-Trujillo, Sacred Heart- Jaén, Alcides Vásquez–Bambamarca. We opened on Saturday with the theme: Caring for Life and Creation, following the methodology of the Schools of Forgiveness and Reconciliation, and there was also a talk on the encyclical “Laudato Si”. 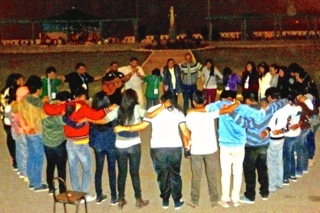 In the evening we had a simple celebration presenting the gifts and talents of each group of delegates. After the Sunday Eucharist we walked to Morro Solar in Chorrillos, praying the "Missionary Rosary" as we walked along, uniting with the call for world peace and reaffirming our commitment to caring for our Common Home. We ended the day around a bonfire, giving thanks for life shared as members of the family of the Sacred Heart. On Monday each delegation presented the experience of their meetings, formation and mission as Sacred Heart Youth in their various institutions. 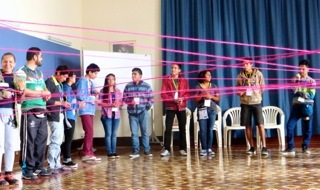 Afterwards we worked together on the profile of Sacred Heart Youth, in order to choose the leaders from each of the institutions who will carry the second Workshop (Campamento). We ended with the sending of the delegations to witness to and live the mercy of God. They were days of meeting one another again, sharing, reaffirming the presence of the Lord in our lives, listening carefully to what He asks of us, recognizing ourselves as being part of the Sacred Heart Family.